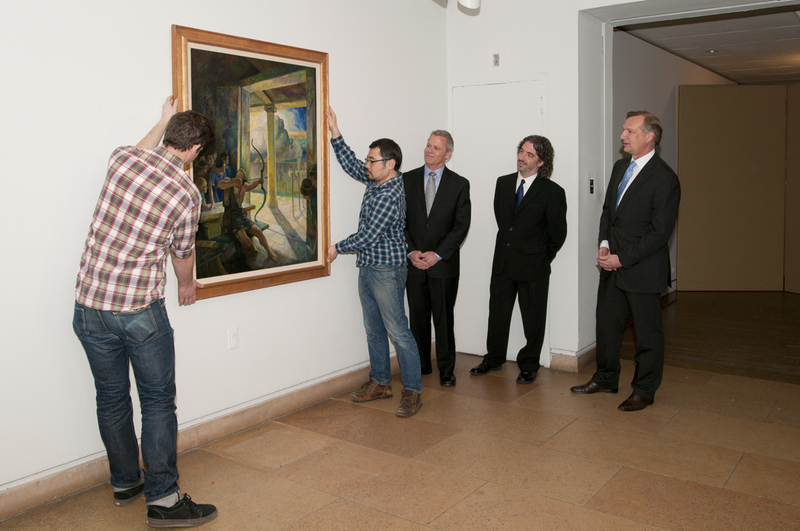 GSK recently donated an illustration by N.C. Wyeth to the Philadelphia Museum of Art. The picture--one of a series that was long thought lost by the art world--hung in our former Philadelphia offices, barely a mile from the venerable institution that now proudly displays it. The first painting by N.C. Wyeth to enter the Philadelphia Museum of Art Collection, The Trial of the Bow comes to the Museum accompanied by a delightful story of loss and rediscovery. A renowned American illustrator, Newell Convers Wyeth thrilled generations of readers in the early twentieth century with his bold visualizations of beloved tales of fantasy and adventure. Wyeth was born on a farm in Needham, Massachusetts and spent most of his life on a sprawling homestead in Chadds Ford, Pennsylvania, 10 miles north of Wilmington, DE along the Brandywine Creek. Here he raised five children, most notably his son Andrew Wyeth, who would become a great painter of American life. The N.C. Wyeth house and studio is now a part of the Brandywine River Museum, which houses the largest collection of N.C. Wyeth's work in the world. As a star student in the Wilmington school of renowned illustrator Howard Pyle, Wyeth absorbed Pyle's creed that dictated historical accuracy spiced with maximum dramatic effect, and applied it in his own highly successful illustrations for many popular magazines of the period, such as Harper's Monthly or Ladies' Home Journal, as well as his illustrated editions of literary classics such as Treasure Island (1911), The Last of the Mohicans (1919), Robinson Crusoe (1920), and many others. As was standard practice for that era's illustrators, Wyeth would frequently paint the images intended for reproduction in the books. 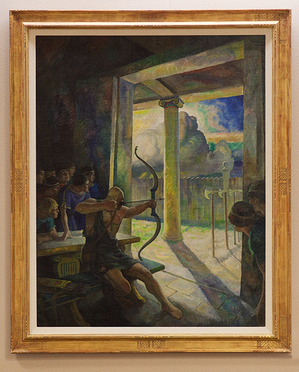 This was also the case with The Trial of the Bow (1929), reproduced as an illustration in George Herbert Palmer's translation of The Odyssey of Homer (1929). This painting captures the critical moment when Ulysses, hiding in disguise among Penelope's suitors, finally reveals himself by shooting an arrow from his own rigid bow, which had failed to yield to anyone else: "Then Ulysses took the bow in his hand, and ...then he bent it, and strung it, and he twanged the string, and the tone of it was shrill and sweet as the cry of a swallow. After this he took an arrow from the quiver, and laid the notch upon the string, and drew the bow to the full, still sitting in his place. And the arrow went straight to the mark." The Trial of the Bow is one of sixteen compositions made by Wyeth for the The Odyssey. The entire series was sold by the artist to a private collector in Katonah, NY in 1930, and later scattered. Most of the paintings from the series are considered to be missing today, and just five had known locations--until now. Recently assessing its art collection as it prepared to move to new quarters, GSK made a surprising discovery: a painting that had been on display at the company's Philadelphia office since the 1980s was in fact one of their most valuable artworks. It was The Trial of the Bow. Having examined the picture, PMA curator Kathleen Foster determined that it was one of the lost Odyssey series canvases. Inscriptions left by various owners on the back of the work reveal further intriguing details. It appears that the painting did not stay in Katonah for long. By 1948, it had already exchanged hands at least twice, and was at one point even sold at a garage sale for just $35! Rediscovered after more than eighty years missing, the painting has now joined the collection of the PMA through the generosity of GSK. The company is a steadfast corporate supporter of the Museum, providing multi-faceted support for our programs and operations for over thirty years. Some of the well-received special exhibitions supported by GSK in the recent past are Van Gogh Up Close (2011), Picasso and the Avant-Garde (2010), The Art of Nandalal Bose (2008); Renoir Landscapes (2007); and Andrew Wyeth: Memory and Magic (2004). The Museum relies on the support of corporate leaders like GSK to help sustain its operations, collection, and exhibitions program, which does so much to enrich the life of our community time and time again. Anna Vallye is the Andrew W. Mellon Postdoctoral Curatorial Fellow at the Philadelphia Museum of Art.